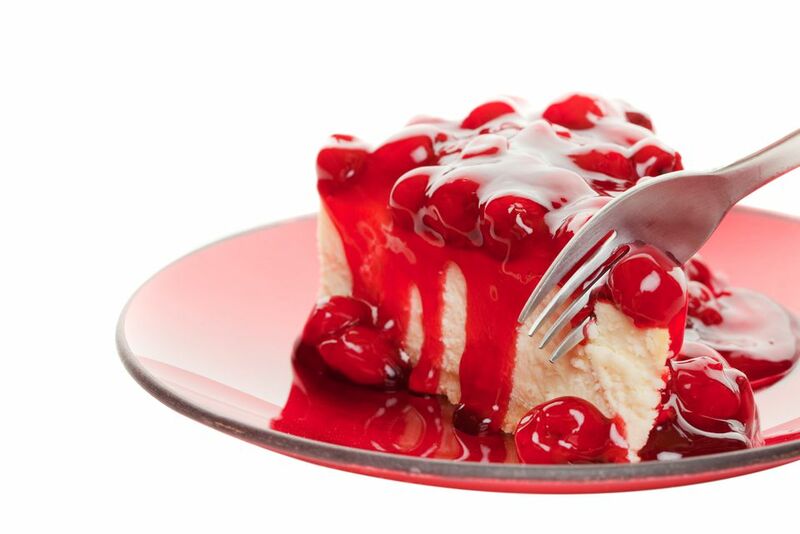 This is an easy and delicious cherry cheese pie. The pie is made with a graham cracker pie crust, a rich cheesecake filling, and an easy cherry pie filling topping. The pie may also be made with a blueberry or strawberry pie filling topping. If you want something a little different, try making the pie with a pretzel crust. Your friends and family will love the unexpected flavor and texture of the pretzels with the sweet filling and cherries. For instructions for a pretzel or cookie crust, see the variations below. Heat the oven to 400 F. (Or to 350 F for a pretzel crust, as below). In a bowl, combine the graham cracker crumbs, 1/3 cup of granulated sugar, and 6 tablespoons of melted butter until well blended. Press the crumbs into a 9-inch pie pan. Remove to a rack and cool the crust completely before filling. Reduce the oven temperature to 325 F.
In a mixing bowl with an electric mixer beat together eggs, 1/2 cup of granulated sugar, vanilla, and sour cream. Gradually add the softened cream cheese, beating well. Beat in 2 tablespoons of melted butter. Pour the cheese filling mixture into the prepared and cooled graham cracker crust. Bake at 325 F for 35 minutes, or until the filling is set in center. Will firm up as it cools. Top the pie with cherry pie filling; chill thoroughly before serving. Garnish with whipped cream or prepared whipped topping, if desired. Pretzel Crust - Combine 2 cups of finely crushed small pretzels or pretzel sticks with 1/4 cup of packed brown sugar and 3/4 cup of melted butter or margarine. Press the crumb mixture into the bottom and up the sides of a lightly buttered 9-inch pie plate. Bake at 350 F for about 10 minutes. Remove from the oven and cool on a rack. Cookie Crust - Combine 1 1/2 cups of finely crushed vanilla wafers or similar cookie crumbs with 2 tablespoons of granulated sugar and 5 tablespoons of melted butter. Mix well and press into the bottom and up the sides of a 9-inch pie plate. Bake at 350 F for 8 to 10 minutes. Cool completely on a rack.